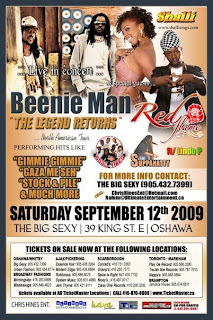 Fast rising canadian based reggae singer Shalli and the King of the Dancehall Beenie Man will be headlining a Live Concert Showcase on September 12th in the Canadian city of Oshawa. Born in Toronto Canada Shalli is no stranger to reggae enthusiasts living in her hometown and rightfully so considering her debut single "Shalli Sings" took off like a rocket, entering mainstream radio airwaves around the world. The song which was released by Planet Rock / Soul Kiss is featured on the Cuss Fix Riddim produced by Upsetta Sounds. Still on the come up Shalli will be looking to represent well alongside the doctor Beenie Man who just last week had a successful staging of Beenie Man Sizzle, a show which saw performances from the international rap boss Rick Ross, the A Bay Bay prince Hurricane Chris, the Judgement Yard legend Sizzla, Gaza leader Vybz Kartel, D Angel and G Whizz to name a few.